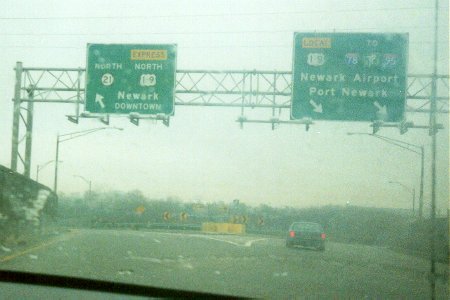 The rainy east end of US 22 near Newark International Airport in New Jersey. 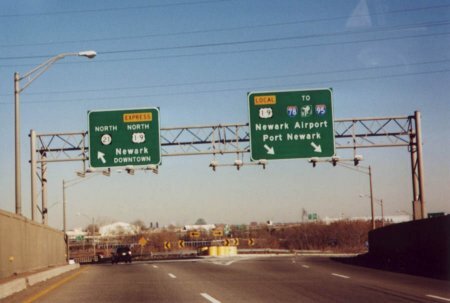 Notice how the freeway splits to give access to the local and express lanes on US 1/9. Photo by Adam Froehlig, taken late November, 1999. A better (and much dryer view) of the above location. Photo by Alex Nitzman. A different view...this one shows the exit for US 22 from the express lanes of southbound US 1/9. Photo by David Greenberger, taken August 1998.